Trinitarian love is the heart of community in Combermere, Ont. Much is being written these days about the need to restore a Catholic culture. It was the genius and culmination of the gifts of the founder of Madonna House, Catherine Doherty, to create, on a small scale, a place where people could experience this. Saint Benedict created such a Catholic world in his monasteries. Our main centre and our houses are places where a Catholic world can be experienced. Such places are not the only answer to this cultural need, but they are one answer. Many such small Catholic worlds exist in other communities. People can visit them and take back to their own lives whatever aspects of the Catholic culture they experience and that are relevant to their vocations. The phrase "divine milieu" comes from the title of a book by Pierre Teilhard de Chardin, one of the most influential and inspiring Catholic writers of the 20th century. It's an apt and beautiful phrase for articulating how a deeper penetration into Love and by Love takes place in our Madonna House way of life. Everyone needs, and is seeking, a kind of fullness that gives life meaning. This fullness is both a vision of reality and a place to live it out. For us in Madonna House, this fullness is Catholicism expressed in the vision of Catherine. The spiritual environment, the atmosphere, the "Catholic divine milieu," if you will, permeates our life. There are two main concentric circles in the divine milieu in which we live. The most comprehensive and fundamental is the Trinitarian life. We are immersed, penetrated, embraced by the Father, Son and Holy Spirit. This Trinitarian mystery is our origin, model and destiny. The second overarching milieu is the Church, the new creation of the Holy Spirit. (Tertullian expressed this reality as the Church of the Holy Spirit.) In some way, the whole human race belongs to this new community. More specifically and concretely, every Catholic parish and community is an ecclesiola, a little church. In our constitution or way of life, Catherine says that we are a family within the great family of God that is the Church. Our ecclesial reality is, after the Trinitarian, our next most all-embracing milieu. Every aspect of Madonna House is penetrated by these two divine atmospheres capable of leading those who are open to them to a deeper immersion in the Trinitarian life. The basic formative agent is the community life itself. It is through all the aspects of our life together that the Trinity affects our transforming union. The Trinity is always penetrating us substantially, otherwise we would cease to exist. But in order for the Trinity to be in us effectively, there must be a conscious participation in the divine life as persons in a relationship of mutual love. Saint John Paul said that young people are joining new communities these days, not so much to become teachers or missionaries or contemplatives, but to become persons. Madonna House seeks to form the whole person so that she or he may become—yes—a person in the fullest meaning of that word. We are called, as persons, to consciously relate to the Trinity in whom we live and move and have our being, who even dwells within us since they have made their home in us (John: 14, 23). The community seeks to foster love for the Trinity and an awareness of the Trinity's love for everyone. "For from the beginning, Christian education was conceived not so much as learning a lesson but as an introduction into a new life, or still more as an initiation into a mystery. Christian education was something that could not be conveyed by words alone, but which involved a discipline of the whole man; a process of catharsis and illumination which centred in the sacred mysteries and which was embodied in a cycle of symbolism and liturgical action." This is also how Catherine Doherty conceived Christian education or formation: It must address and touch the whole person and not simply the mind through instruction, as in a classroom. Using a phrase from the Russian author Gogol, she called Madonna House a "university of life." The Second Vatican Council was seen as a new Pentecost, with the nature of the Church as its major emphasis. Through the inspiration of the Holy Spirit, the 20th century saw the birth of several hundred new families of dedicated life. The Church calls them ecclesial communities because the Holy Spirit, in this era, is seeking to reveal the many-faceted splendour of the Church's life. For a variety of reasons, the "faith problem" for many people in our society today is not the existence of God or the divinity of Jesus Christ but the Church. By giving birth to these new communities, the Holy Spirit is seeking to reveal the many ways in which the beauty and reality of the Church can be lived and experienced. Madonna House is one of the earliest of these new ecclesial communities, having come into being in Toronto during the 1930s. The Canadian Cardinal Marc Ouellet, now well-known as one of the papabile of the last conclave, has called it the mother of all the new communities in Canada. Because of Catherine's spiritual genius, one of the greatest gifts she had to offer to the new communities is precisely a profound vision of formation in the Christian/ Catholic life. One creative source of this genius was her background: She came from an almost medieval society where most of the people were still porous to the world of faith. She lived for most of her young life in a world of churches, monasteries, icons, processions, pilgrimages and home liturgical customs. In other words, she had in her very being a cultural Christianity that she could draw on when creating her own community. Few founders of new communities have such an inborn wealth to mine. Some of these communities, such as Hearts Home, are already using Catherine's spirituality for their own formation programs. The essence of the "initiation into the mysteries" would be the same for each community; the practical manifestations of transmission would be different. The sharing of life with our guests is one of the essential elements of our Madonna House way, and fundamental for our growth as well. Thus, through decades of living with ourselves and our guests, we have been taught some deep things that can help others grow in their Christian life. The inner world of our guests spans a very wide spectrum. Some may have had a very good Catholic formation in a home-school environment and, in their minds and hearts, they may already be permeated by the Catholic divine milieu. Others, through their own particular journey, may also be fairly centred in their faith and well along on their pilgrimage. At the other extreme, some guests may come from a dysfunctional family, been in and out of the Church, on and off drugs. They may be in various stages of spiritual and emotional confusion. They might have some kind of Christian background in some other faith community, or perhaps they are seeking some initial understanding of Catholicism. Generally, if they have decided to come to Madonna House, they will certainly know that we are a Catholic community. But whatever their interior world may be, they are in need of further Christian transformation on all levels. This is what we seek to provide in a comprehensive sense. To quote Christopher Dawson again: "Christian education was not only an initiation into the Christian community, it was also an initiation into another world, the unveiling of spiritual realities of which the natural man was unaware and which changed the meaning of existence." The phrase "another world" doesn't mean a spiritual world abstracted from ordinary life. The other world is the transcendental world of faith, the divine life of the Trinity, which penetrates this world and for which our whole being longs. Madonna House seeks to communicate, unveil and give a good taste of the mysteries of faith to fill the "transcendental longing" that is in everyone's heart. Madonna House is a transcendental place where one can breathe the world of faith. The Christian tradition has a lot to say about filling this longing, about how to lead someone onto a "process of catharsis and illumination," along an authentic path of renewal to a life illuminated by faith. A helpful guide to what the Holy Spirit is doing here at Madonna House can be found in Charles Taylor's A Secular Age. Taylor frames the issue bluntly at the very start of the book: "One way to put the question that I want to answer here is this: why was it virtually impossible not to believe in God in, say, 1500 in our Western society, while in 2000 many of us find this not only easy, but even inescapable?" What happened between 1500 and 2000? He develops the idea that in the ages of faith, people lived in an "enchanted world" of God, good and evil spirits, surrounded by objects such as relics, shrines and sacraments that emitted spiritual power. Everyone then was porous, open to these influences, embedded in a society permeated by spiritual realities. But then, down through the centuries, due to innumerable intellectual, political and cultural factors, the great disembedding took place. One after another, buffers arose and buffeted the person from the spiritual world. Many modern people are now non-porous, isolated in their buffered prisons. They have lost all sense of transcendence and are totally secular, that is, of this world. This is not a moral judgment. It's an ontological statement of the onedimensional reality in which many live. They are no longer porous to the transcendental world of faith. Pope Benedict XVI, in his speech to the German Bundestag on September 22, 2011, used another analogy to describe the same buffered cultural state described by Taylor. He said that "the positivist reason which recognizes nothing beyond mere functionality resembles a concrete bunker with no windows, in which we ourselves provide lighting and atmospheric conditions, being no longer willing to obtain either from God's wide world.... The windows must be flung open again, we must see the wide world, the sky and the earth once more and learn to make proper use of all this." Madonna House seeks to fling open all the doors to God's light and love that have been systematically closed over the centuries. Imagine Western civilization in that year of 1500 as being inside a great cathedral, with the sunlight streaming through stained glass windows depicting the mysteries of our redemption. Then, as the centuries go on, these windows are whitewashed, no longer conveying the sacred images. Whitewashed with what? The brush of rationalism (only what we can know with our minds is true); the brush of scientism (only what can be measured and observed is true); the brush of relativism (there are no absolute truths); the brush of indifferentism (one religion is as good as another); the brush of atheism (there really is no God); the brush of unbelief in the Scriptures, in Christian tradition and in the Church. Until, finally, many people are in a dark building with perhaps only a few candles casting a slight flicker to illuminate their immediate surroundings. There is no transcendent light illuminating the multicoloured mysteries of the faith; and thus their minds and hearts are in the dark. Using Taylor's terms, Madonna House is a transcendental space seeking to make the person porous to spiritual realities, to the presence of the Trinity, dismantling the myriad buffers that have been erected over the centuries to block out the transcendent. Another general characteristic of the secularism by which we have all more or less been affected is that our Western society is permeated by a collapse of anything approaching a Christian culture. Beginning in the 16th century, "culture" meant the domain of human growth and development. Eventually, Ralph C. Wood says in Contending for the Faith, the word "civilization meant the same thing: civilization entailed a set of restrictions and limitations no less than a host of virtues and possibilities. To be civilized meant that human character is to be shaped by received communal traditions and mores, that citizens are formed by values and virtues which they do not choose for themselves but which they receive almost through the pores of their skin, via the atmosphere of their homes and schools, their holy places and their cities." The emphasis in Madonna House is on culture as something received, in contrast to the modern subjective attitude of creating one's own personal culture. Let me give examples from my own experience. For most of my life, I have lived in a Catholic culture. Catholicism seeped into my pores as something objective, without my constructing it out of my subjective choices. First there was the family and parish life; then Catholic high school; then two years in both a Trappist and a Carthusian monastery. In this monastic experience especially, the culture was objective, given to me, and I grew by absorbing the worship, the rules, the silence and the directives of those who knew more about Christianity than I did. I trusted them. I experienced Max Weber's definition of culture as the "web of significance, the matrix with reference to which everything else makes sense." The anthropologist Clifford Geertz defines culture in similar terms as a "historically transmitted pattern of meanings embodied in symbols." Such an experience is totally foreign to most modern people. According to Wood, "Culture in its modern sense does not seek to shape us towards definite predetermined ends, so much as it liberates and improves us according to ends, whether personal or social, that we freely choose for ourselves." I want to emphasize this difference between traditional culture and the modern culture-creation of the subjective self as it forms one of the very major differences between life in the modern world and what people will experience in Madonna House. The notion that we are free only as we become autonomous selves who have been immunized from all moral and cultural obligations except those we have independently elected is, after all, a notion of very recent vintage. We are all largely unaware that our entire culture is collapsing. Christopher Clausen argues in the Faded Mosaic that we are not witnessing the dawn of a new freedom-giving multiculturalism but rather the sunset of culture as such—if by culture we mean "a whole way of life." I believe the crowning achievement of Catherine Doherty's life was the creation of a Catholic formation centre that offers—at least on a small scale and for a limited amount time—an invitation to live in a Catholic culture without creating it for oneself. Madonna House presents itself as a Catholic culture in the traditional sense, as a "web of significance," as a "historically transmitted pattern of meanings embodied in symbols" that we ask people to accept, and not try to change, in order to be formed through the pores of their whole being. Part of the inner struggle of people who come here is, "I have not chosen these forms and symbolic worlds. I want to make up my own cultural life." It is precisely this subjective choosing of constructing their own culture that the community of its very nature asks people to relinquish. The "web of significance" includes our daily liturgy, divine office, ever present religious artifacts, teachings based on Scripture and Tradition, and a definite way of life permeated by the spirituality of the Gospel that we ask people to follow for the community's order. Cardinal Ratzinger, before he became Pope Benedict XVI, referred to a concept of "creative minorities" in his book Without Roots. He was speaking about the renewal of Christian roots in Western societies, and especially in Europe. He refers to the historian Arnold Toynbee's analysis of the crisis and cure for the restoration of our civilization. Toynbee defined true progress as spiritualization: "He recognized that the Western world was indeed undergoing a crisis, which he attributed to the abandonment of religion.... For him this crisis had a name: secularism.... He offered a voluntaristic [vision] focused on the energy of creative minorities and exceptional individuals." Cardinal Ratzinger speaks of creative minorities in a general sense, but what he says applies, of course, to creative minorities within the Catholic Church. Along with the Bible and the Church, Cardinal Ratzinger saw monasticism as one of the foundation stones of European Christian civilization. "Throughout the great upheavals of history, [monasticism] has continued to be the indispensable bearer not only of cultural continuity but above all of fundamental religious and moral values, the ultimate guidance of mankind," he states in Without Roots. "As a pre-political and supra-political force, monasticism was also the harbinger of ever welcome and necessary rebirths of culture and civilization." Father Edward T. Oakes, SJ, was one of the foremost scholars of the thought of Hans Urs von Balthasar. He quotes a passage of the latter on the demise of culture in the modern world: "Before the dawn of the technical age, it was easier to create genuine culture from genuine recollection. Life was more peaceful; man's surroundings expressed eternal values more directly. How immediately can a landscape absent of men unite us to God?" He means, How much more can a landscape devoid of billboards, wind turbines, motels and so on unite us to God? Oakes comments: "Perhaps Christians will wake up to this pathos and create, like the Benedictine monasteries after the collapse of the Roman Empire, little islands of civilization and peace where prayer becomes once again possible in union with nature; but the prospects for such a turn of events, it should go without saying, are not bright." I think he means that the prospects of having thousands of such little islands—as there were thousands of Benedictine monasteries—are not bright. But it's possible to have some, and Madonna House is one of them. Such creative minorities or little islands cannot be built by experts. No committee or council, whoever its members, can possibly generate a global ethos. Something living cannot be born except from another living thing. "Here is where I see the importance of creative minorities. It is crucial to have convinced minorities in the Church, for the Church, and for society, communities of persons who in their encounters with Christ have discovered the precious pearl that gives value to all life (Matthew13:45 ff. ), assuring that the Christian imperatives are no longer ballast that immobilizes humanity but rather wings that carry it upward. Such minorities are formed when a convincing model of life also becomes an opening towards a knowledge that cannot emerge amid the dreariness of everyday life. Such a life choice, over time, affirms its rationale to a growing extent, opening and healing a reason that has become lazy and tired. There is nothing sectarian about such creative minorities. Through their persuasive capacity and their joy, they reach other people and offer them a different way of seeing things." I mention one more aspect of the renewal of a Christian civilization pointed out by Cardinal Ratzinger that figures very prominently in Madonna House—the restoration of the sense of the sacred. We have seen that for Charles Taylor, secularism means the loss of the sense of transcendence, of the sacred. Ratzinger wrote, "It is our duty to cultivate within ourselves respect for the sacred and to show the face of the revealed God.... Unless we embrace our own heritage of the sacred...we will also fail in providing a service to others to which they are entitled.... To the other cultures of the world, there is something deeply alien about the absolute secularism that is developing in the West." I have mentioned that the divine milieu of Madonna House is basically Catherine's vision and cultural expression of Catholicism. A fairly recent term used to describe our Catholic life today is evangelical Catholicism and it is a modern confirmation, for me, of her vision. I first came across this expression in John Allen's The Future Church, where he calls it a trend. Allen's book is focused on various trends in the worldwide Catholic Church that will be with us for the foreseeable future. "The defining features of evangelical Catholicism are: a clear embrace of traditional Catholic thought, speech and practice, the usual word for which is orthodoxy; eagerness to proclaim one's Catholic identity to the world, emphasizing its implications for culture, society and politics; faith seen as a matter of personal choice rather than cultural inheritance," he says. George Weigel uses the term similarly in a more recent book, Evangelical Catholicism. Weigel uses it to describe the essence of the whole Church. The main characteristics, Weigel says, are personal friendship with Jesus; affirming the Catholic Church's teaching about revelation; celebrating the seven sacraments; constant conversion and dedication to works of charity; embracing the authentic liturgy of the Catholic Church; being Biblically centred; a hierarchically ordered Catholicism respecting other vocations; being ordered to mission and to the proclamation of the Gospel. As I was reading this description of evangelical Catholicism, I couldn't help but think "this is the nature of Madonna House. This is Catherine's vision." This conviction is based on my living the Madonna House way of life for over 40 years and on my knowledge of Catherine`s life and teachings. It is based, as well, on some facts about Catherine's life that correspond with how both Allen and Weigel see the origins of evangelical Catholicism in the writings and pontificate of Leo XIII. Weigel, especially, notes that Leo XIII set in motion the end of Counter-Reformation Catholicism that has continued into the 21st century. Leo's groundbreaking encyclicals on social issues, Biblical studies, liturgy and Thomistic philosophy set in motion the trends of evangelical Catholicism. Catherine studied those encyclicals in her early years, and her personal mentors were some of the teachers who implemented those encyclicals in the Church of the early 20th century: Dom Virgil Michel in liturgy; Father Paul Hanly Furfey on the social encyclical; the Thomistic scholar Father Henry Carr in Toronto. Weigel concludes his book on the theme of the universal call to holiness. Again, Catherine was preaching this universal call all her life, beginning in the 1930s. She was a pioneer in what is now being described as evangelical Catholicism. When people come to Madonna House, they will be immersed in it. Madonna House was not born from some abstract plan of what a Catholic community should be, worked out by experts; much less was it put together by a committee. 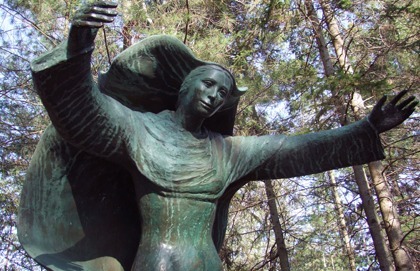 Because Catherine carried this vision in her from her Christian past, Madonna House came forth like a baby from a very "living thing," her spiritual womb. At the end of his book After Virtue, Alasdair MacIntyre says our civilization needs a new Saint Benedict. So far, a single individual of the stature of Benedict has not arisen. What we are witnessing, however, is a number of new spirit-led individuals who are giving birth to those creative minorities that Toynbee and Ratzinger called for. What we are witnessing are many new Benedicts and Scholaticas. In the last century, the Holy Spirit has raised up a number of such creative geniuses. We believe Catherine was one of them. Her spirit lives on in Madonna House. Fr. Bob Wild has been a member of the Madonna House community since 1971.